Products I’m loving right now …. Welcome back 🙂 Its always good to have you here . Today’s blog post is about the products I’m loving right now. Since I started working closely with my dermatologist, I’m more concerned about what goes into my skin . Beyond the surface , there is indeed more that you can do to achieve the best skin ever . You still have to start from the basics which i call ‘ECTM’ Exfoliate, Cleanse, Tone & Moisturize. You can never go wrong . Not like I don’t know this, but do you know that a good nights rest (with the right products is an easy way to get your skin glowing ? How many of us get enough sleep ? There was a time I tried it and I saw the results, but somehow..life happened lol. I’m still working on the process of getting at least 8 hours of sleep a day . I still struggle with under eye bags and some fine lines but that’s okay . No pressure . 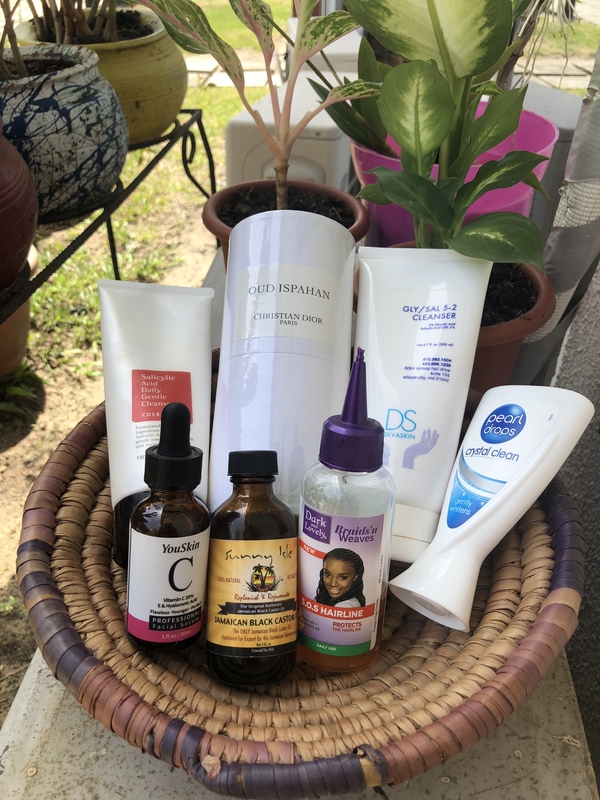 Anyway, here are the products I’m currently using. Since I’ve got extra sensitive teeth , the idea of getting my teeth whitened has been thrown out the window…lol , I’ve attempted this twice and I cried my eyes out . When I was much younger , I got the Pearl drops white drops off the shelves at the supermarket, its basically a toothpaste that gently whitens your teeth, I stopped using it for a while and re-discovered it again , at least my teeth isn’t brown ..lol .You can get it at any supermarket . The Jamaican Castor oil is great to keep my hair moisturized and as you all know I recently braided my hair, I’m terrified i’ll lose my edges so i’ve been moisturizing my edges (Temple hair) daily using this SOS Hairline from Dark & Lovely . Finally, I added a new fragrance to my collection, the Oud Ispahan by Christian Dior . This fragrance was launched in 2012 and its so amazing . I got introduced to the fragrance last year by Eve of @theluxeoutlet and its definitely one to have . It’s unisex. top notes include Labdanum, middle notes Patchouli, base notes sandalwood , argan(oud) & rose . Its a powerful fragrance and a little goes a long way . Do you have any products you are currently using, is there any from the above mentioned, share with me . I hope you enjoyed reading.